Influencer engagement happens in the moment. And it follows an always-on approach. Once you begin establishing a rapport with your influencers, you can look for opportunities to engage into an active conversation. 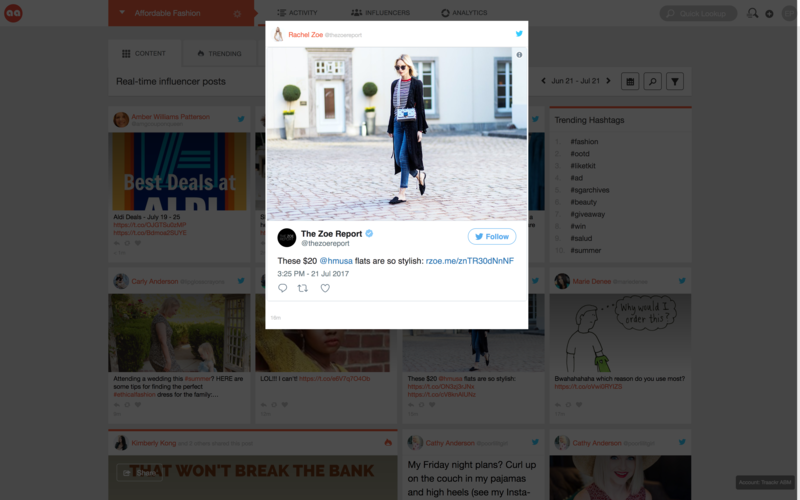 Traackr helps you monitor influencer activity across social channels and seize the opportunity to engage, from the platform, with a relevant message—respond to their tweets, share their videos, comment on their posts. You can build your relationships with these simple daily actions. Joining the ongoing conversation, as it happens, is the best way to nurture relationships with influencers and even seed your own content, in an authentic and relevant way. How can I engage with influencers’ content? When you engage with a post on any social channel, you’re using the social handle you’re currently logged in to (from your browser). Can I engage with influencers via Hootsuite or Buffer? If you’re using Hootsuite or Buffer for social scheduling and engagement, you can install the free Hootlet or Buffer browser plugins that will enable you to initiate engagement with your influencers in Traackr via these third-party apps. Click on the Reply or Share icon. A popup opens to compose your message. Click on the Hootlet or Buffer button, select a social profile and schedule your message.